The holiday spirit of giving moves beyond the plate for this cherished community cause. Join Elevarte Community Studio this Saturday, Dec. 7th from 6 PM to 10 PM for the fourth annual La Pozolada, an evening of culinary delight and communal celebration of food, family and art. An eclectic pozole competition, Sonoroma’s danceable sounds, artisanal arts and crafts, and a game of chance highlight this festive benefit. “Our Elevarte staff and board want to take this opportunity for our community to come together and really celebrate our accomplishments,” Elevarte Executive director Giselle Mercier said. Established in 2010, La Pozolada is Elevarte’s signature fundraiser, a reinvigorated concept that stars the beloved pozole, a rich, hominy stew composed of Latin cuisine staples such as maize, chili peppers and meats such as pork, chicken or steak. The idea of a warm, bowl of soup inspires creative recipe twists. These twists will be showcased as local residents and restaurants engage in a friendly competition for the 2013 Cuchara de Oro Award. La Pozolada attendees will vote for their favorite pozole dish and the winner will receive a 100 dollar gift card from La Preferida. The Cuchara de Oro cheftestants feature restaurants DeColores Pilsen, Restaurant y Taqueria Guerrero, and Sobremesa Supper Club along with individual and family cooking teams. 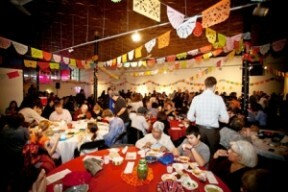 This year’s La Pozolada theme is La Loteria, the popular Mexican game of chance. The card game hopes to engage children and adults alike. Yet La Pozolada plays a role in Elevarte’s larger community health initiative, encouraging community members to be more conscientious about their food consumption, but also respecting the value of a shared meal. “The whole idea of cooking for family members creates family,” Mercier said. Ultimately, La Pozolada will help Elevarte continue their commitment in championing the talents and ambitions of promising neighborhood youth. La Pozolada 2013 will take place at Local 399, International Union of Operating Engineers located at 2260 South Grove Street Chicago, IL 60616. Elevarte Community Studio is a Pilsen-based non-profit community organization located at 1119 W Cullerton St, Chicago, IL 60608. Pre-ordered tickets are 50 dollars and walk-in tickets are 60 dollars. For information, visit www.elevartestudio.org or call 312-226-7767.